Every business owner is forever looking for ways to save money and cut back costs. Investing in fax to email technology is a great way to achieve both. Aside from saving your company money, you will also be spurring on productivity and greater efficiency among your team members. In the past people had to wait their turn for the fax machine, since when one person was sending or receiving a fax, no one else could use the fax machine. Larger offices would need more than one fax machine to keep up with the demand for the technology. This would lead to even more expensive consumables being consumed and more than one dedicated fax line too. Now your employees will use the internet connection to send and receive as many faxes simultaneously as they need to, without even having to get up from their desks. If you have teams on the road, they can also send and receive all their faxes without even being present at the office. 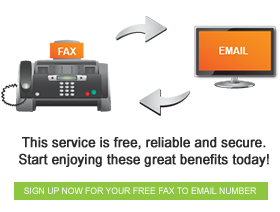 These and many other features of fax to email technology will help to increase your office’s efficiency. Grow your business by investing in this state of the art technology and sign up with an online fax service provider today. Your fax number will be associated with your email address and you will be ready to hit the ground running in no time and start enjoying its incredible benefits.